Forty per cent said they felt bad if nobody liked their selfie and 35% said their confidence was directly linked to the number of followers they had. One in three said they lived in fear of cyber-bullying, with appearance cited as the most likely topic for abuse. One expert said children were growing up in “a culture of antagonism”. 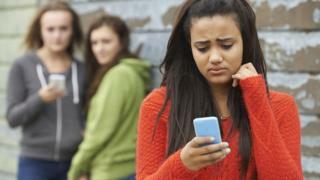 The survey, of more than 10,000 young people aged 12 to 20, suggested that cyber-bullying is widespread, with nearly 70% of youngsters admitting to being abusive towards another person online and 17% claiming to have been bullied online. Nearly half (47%) said they wouldn’t discuss bad things in their lives on social media and many offered only an edited version of their lives. “There is a trend towards people augmenting their personalities online and not showing the reality,” said Ditch the Label’s chief executive Liam Hackett. It found that Instagram was the vehicle most used for mean comments. Mr Hackett said: “Cyber-bullying continues to be one of the biggest challenges facing young people. He called on social networks to put more resources into policing the comments people post online and responding to complaints in a more timely manner. His views were echoed by Anne Longfield, the children’s commissioner for England, who also called for a government ombudsman to be set up to mediate between the social network firms and children who are having problems. She also called for “compulsory digital citizenship classes” in schools. The findings appear to contradict research from the Oxford Internet Institute (OII) earlier this month that suggested cyber-bullying was relatively rare. The OII research – which concentrated on 15-year-olds – found that, while 30% reported regular bullying, only 3% said it happened both off and online. She said that she was not surprised by Ditch the Label’s findings. “We are living in a culture of antagonism. That sadly is the climate our children are growing up in,” she said. But, she added, adults also needed to think about their usage.